Aware of her devotion to both the goddess in particular and cats in general, I wanted to surprise her with the two-foot-tall Bastet statue. I spent some three weeks painstakingly completing the multicolored necklace, earring, stand, and other features. At last, I carefully installed its glass eyes, which gave the figure a startlingly lifelike appearance. Bastet was carefully loaded in the front seat of my car, and we drove from my home near Chicago to Lakeville, a Saint Paul suburb, where Nancy and I planned to have dinner with a mutual friend. Before the table was set, I placed in front of her the tall object, veiled by a cloth. Nancy had an active sense of the mysterious, and I enjoyed conducting minor melodramatic exercises such as this one. After completing some overblown narration about "the living deities of ancient Egypt," I whisked off the concealing cloth to reveal the proud, bejeweled, sacred white cat goddess in all her painted, plaster glory. Unbeknownst to me, for the previous three years, whenever Nancy visited (in her case, "made a pilgrimage to" would be closer to the truth) a sacred site on what she referred to as the North Shore -- somewhere along the Minnesota coast of Lake Superior -- she carefully selected a particular kind of rock that she needed to make her rune stones. After she collected the proper number, she hand-painted all twenty-four, then sewed a bag for them. She had only recently completed her project, and she chose my Lakeville visit as an opportunity to present it. Unaware of our separate labors, we had worked simultaneously to create sacred objects for one another, and independently decided to give them to each other at the same time. Our meaningful coincidence added a mystical dimension to the exchange of statue and runes that substantially enhanced their personal significance. 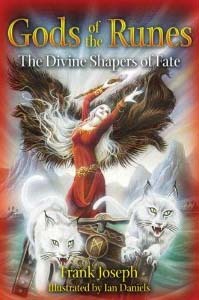 Also, Mardal-Freya, the Norse goddess of love and divine keeper of the sacred mysteries, is symbolized by a pair of white cats (see the front cover of this book). I could not have hoped for a more magical introduction to the occult practices of the Vikings, their ancestors, and their descendants. Some years before this most appropriate encounter, I was developing a growing fascination for divination and its kindred phenomenon: synchronicity. This latter twist of the paranormal was also the title of a book by Carl Gustav Jung, the man who coined the term. He wrote at length about an ancient Chinese prognosticating system, the I Ching, or Book of Changes, which was founded on the belief that humanity and the cosmos share the same life energies and are more closely interrelated than external appearances suggested. An individual human being and blade of grass are linked in an all-encompassing matrix that is more experienced than seen. The identical motions of an infant spiraling out of its mother's womb or a galaxy spiraling and swirling around a black hole in outer space respond to the common rhythms of nature. Determining the patterns of one must reveal those of another. The I Ching is very old -- it is said to have been discovered by the legendary emperor Fu Hsi in the twenty-fourth century BC, when he noticed the hexagram pattern on the shell of a tortoise emerging from the Yellow River after a destructive flood. The earliest archaeological evidence of the I Ching were oracle bones from the Shang dynasty, circa 1500 BC. Three hundred years later, the I Ching's first known practitioner, Wen Wang, is believed to have invented the prognosticating hexagrams. Any divination method able to operate in continuous use for the past three or four millennia has certainly stood the test of time for millions of modern-day practitioners. Though obviously part of a sophisticated system, the I Ching was nevertheless based on superstition, I had always assumed. I was all the more surprised, then, when I read of Jung's high regard for classic Chinese divination. The most important pioneer of modern psychology in the twentieth century used his long-term investigation of Fu Hsi's hexagrams as the basis for Synchronicity, because, the Swiss scholar insisted, they worked. He reported that in randomly throwing the coins (originally, dry yarrow stalks), they often fell into logical patterns that corresponded to current circumstances or psychological conditions, and they accurately foretold coming events in the life of an individual diviner. Jung's emphasis, of course, was on a subconscious relationship between coincidental arrangements of inanimate objects (the I Ching coins) and their perceived meaning to the person casting the hexagrams. Such is the stuff of synchronicity. To order God of the Runes from Amazon.com, click here!